Drying or dehydrating vegetables is one of the oldest known methods of food preservation. And good news, you can dehydrate vegetables at home with equipment you have on hand. Pick your produce at its peak and work quickly to prevent spoilage and to help preserve the colour and taste. Prepare your vegetables as if you were going to serve them. Wash well, trim, cut, chop or slice. 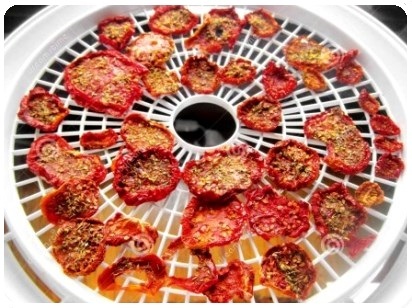 There are three methods used for dehydrating vegetables: Sun dried, electric dehydrator or oven. Sun drying can be a bit of a gamble. Unless you live in a climate that is a consistent 90°F (32°C) with low humidity for a guaranteed 3 days in a row, you risk your produce growing moldy. Once the drying starts, it cannot stop until finished. So don't let your vegetables cool again until they're done. But if you do live in an area where you get several scorcher days in a row, use it to your advantage, save electricity and use the sun for dehydrating vegetables. 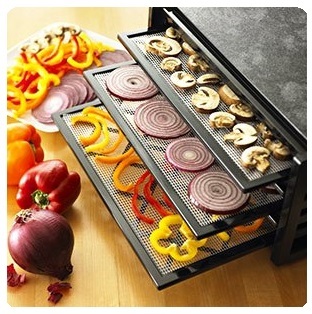 Stand alone dehydrators are excellent, but only if you use them! Many people purchase and do a couple of loads, then forget about them. So think hard about it before you spend your hard earned money on one. So we're left with the oven. It's almost certain that you have one, so nothing new to buy. It is time consuming and a little fiddly, but gives a great result. Tomatoes for drying A home oven will only dry small quantities at a time — up to 6lbs (2.72kg) pounds of produce, depending on the number of racks you have; so don't be preparing bushels of veggies at a time! Set the oven at the lowest temperature and preheat to 140°F (60°C). Drying vegetables at oven temperatures higher than 200°F (93.3°C) will cook them or possibly scorch them. If you are uncertain of the temperature, put a separate oven thermometer on a rack you can see, and check the temperature approximately every half hour. Lay out your vegetables on stainless steel screen mesh or wooden frames covered in cheesecloth. Cookie sheets are the least preferred option, because the air should circulate around the food, but if do use cookie baking trays, then put down baking paper first, and turn your vegetables once or twice during the drying process. Also, having the food sit next to metal sheets may transfer a metallic taste. Using other types of metal materials may react with the food, so please don't. Load up the veggies. Doing trays of items similar in size will keep the drying even. For instance, pumpkin and potato might be a good mix. Try not to mix strong flavoured items as the flavour may transfer from one vegetable to another. Keep the oven door open about 3 inches or so during drying. It is vital that the temperature is maintained no lower than 140°F (60°C) and that the moist air can escape. Most ovens don't have even heat throughout, so move the trays around frequently to ensure even drying and stop any scorching. When dehydrating vegetables, plan to allow drying time of between 4 and 12 hours. Some vegetables get brittle when dry, and some, like tomatoes, just go pliably hard. If you press a finger into the middle of a dried piece of vegetable it should not leave any residue on you. When cool, store in a moisture-proof container. Dehydrated vegetables will keep indefinitely in the fridge. To use, just add them to soups and sauces as they are, or reconstitute (cover them in a container with water 2:1 ratio) for approximately 2 hours before using. Squeeze half a medium lemon into ½ cup of water, or dilute 1-teaspoon vitamin C powder (ascorbic acid) in ½ cup or water. Dip banana slices in mixture and thoroughly cover. Drain and lay a single layer on screen over oven rack, or put into dehydrator and follow directions. In oven, dry bananas for 24-36 hours at 35-40C (105-110F). When leather-firm and dry, have a taste test, cool and store your dehydrated bananas in jars or containers for up to one year in a cool dry place.